Last weeks newsletter article (“The Most Important Question You Can Ask”) generated quite possibly the second largest email workload ever (behind the 4-day backlog generated by “6.18 Reasons Why Fibonacci is an Illusion”). The feedback was all incredibly positive and supportive of my efforts with the YTC site. Thanks to all who responded. It’s greatly appreciated. The feedback also generated some followup questions by a YTC reader, Krasimir, which I thought would be well worth sharing. Before we get to that Q&A, if you have not read “The Most Important Question You Can Ask” then please read that article first. In fact, even if you have read it I advise a quick review of the main concept. I recommend taking the time to work through the question, as it allows you to review his analysis. Have you got any clue that potential trapped shorts at break of C would generate weaker orderflow than those who were struggling with their long positions at D. Perhaps DC swing acceleration seems slower than that of EB swing! Other ideas? Market found a top at D and reversed, easing the pain of the trapped shorts. At C some trapped shorts start to hit the exits and perhaps, some longs entered, finding opportunity of the dire situation of the trapped shorts. At B new shorts start to enter market on the break of the C low. At first glance they seem to me as potential (prospective) – I am not sure I express myself correctly here – trapped shorts, as long as market starts to move above their entry. If I am aggressive I would not wait until market hit their stops (at bar C high) in order to enter the market (here, I think, I got it wrong! ), and would enter earlier, if lower timeframe chart allows. Of course, sometimes trappers become trapped and on the next candle (not seen on this chart) this is a fact. Prospective trapped shorts never become trapped, instead they become trappers. EB down swing looks stronger than DC swing, which might alert me! I’m sorry for the long reply. I hope I do not bother you. I’ll start by responding to the first two of your summary points. 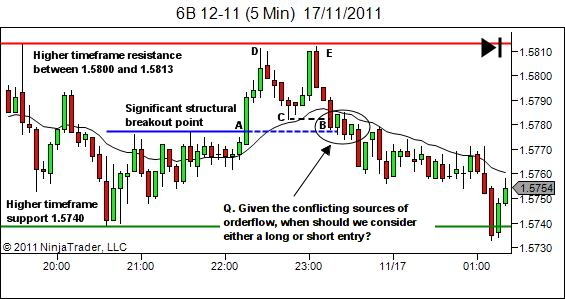 If I had known there would have been such great interest in this article (I’ve been swamped by feedback and Q&A), I would have included a higher timeframe chart to show some multiple timeframe context. It was left out in order to reduce the size of the article, as it was only of minor interest to the main point of discussion, being the necessity to identify points of orderflow that may oppose your trade premise. I’ll talk about the higher timeframe shortly. The red support line you indicate is not a higher timeframe S/R level. As a few readers have made this assumption, it appears that I should have marked this line differently to the higher red line, which is a higher-timeframe resistance level. The level you talk about simply identifies a trading timeframe feature (5-min), being the breakout of the ascending triangle that develops between approx 21:00 and 22:00. Ok… let’s add a higher timeframe (60-min) chart to create an S/R framework. We can now view our trading timeframe (5-min) chart as follows. Rather than address the remainder of your points 3-10, as well as your list of pros and cons for a long entry, let me just summarise a response and then address what I believe is the overall question. Generally your analysis is very sound. I have only a single point of difference in that I’d anticipate the majority of the shorts entered prior to point A would have been scratched or stopped out on the break above A. I doubt many at all from this timeframe would have held longer. Of course some may have, but operating on a 5 min chart, or even a 15 min chart, this level would have been an obvious place to move the stop loss order. As such, subsequent buying at C and B will more likely be a result of shorts from E and F covering their position and new longs entering having missed the initial entry at A. This is of course a minor point, and is largely speculative (I’d love to have open interest information at these timeframes, as that could help in these sort of questions… but that’s not the reality for us retail traders). Other than that, I’d largely agree with your analysis. Let’s get to the crux of the question though. Unless I’ve misinterpreted (and please correct me if I have), your question is really asking the following. If we accept that the limit order entry long used in the previous article was not the best option for entry, then what is the preferred way of entering long (if any), or perhaps short (if any)? And why? In accordance with YTC Price Action Trader definitions, I would have had the environment defined as a sideways range between the upper resistance and lower support, from well before the time of this potential trade setup (not shown on charts). However it is a messy environment, and if you’d defined it as having been a previous downtrend, changing to uptrend on the move AD and now potentially changing to downtrend again… I wouldn’t question it too much. Accepting a sideways trend though, we would ideally be looking for short entries at the resistance level (red line) in the area of D and E and long entries in the area of of lower support (the green line), as a result of the third principle of future trend direction. Intra-range will only provide opportunity if showing a clear intra-range trend. Given the significant nature of the break at A, area B could be a good candidate for an intra-range long entry (as a pullback to prior support in an intra-range uptrend), or offering a potential short entry (as it triggers a change of trend). It really is at a tipping point where price could go either way. At these times on the charts, where I have conflicting sources of orderflow (potential longs at B versus potential shorts from C), I like to consider things in the following manner. My (intra-range) bias is essentially neutral at this time and will simply await a winner from the battle between the bulls and bears. There will be no assumptions made as to which side will win, and no early placement of entries. I await a clear sign of winner and loser before either acting through a trading timeframe LWP entry, or the first pullback after that (which might be a quick one on the lower timeframe). Consider a buyer and seller at a point of neutral bias, where a pool of buyers meets a pool of sellers. The winning direction will be determined based upon which side is the first to give up. As you look at the above diagram please remember we are dealing with net orderflow. There is always a buyer and seller for each transaction. But it’s the urgency with which one side transacts that will move price. Stop loss orders (which when triggered become a market order) are a sign of urgency to act and are a primary source of bullish or bearish pressure. “Giving up” may simply be a result of running out of new buyers or sellers, before the other side runs out. Or it may be that price patterns convince enough of one side that their trade is a likely loser, to have them start a cascading series of exits. Or it may be a result of “time stops” if one side is fighting against a larger timeframe trend, and so may have less tolerance than the other side for holding through a range. Regardless of the reason… future price direction is largely a result of who will give up first. I’m not a time and sales / market depth trader. I do recognise that these methods will likely offer great insight to any changing sentiment at these key times. You may wish to study these methods if they interest you. I trade through price charts. So when price stalls at a tipping point such as we have here, I manage that through watching price and simply awaiting a winner. There are two main options for this. Await a clear lower timeframe (1-minute) pattern based entry trigger (YTC PAT readers refer to the summary table in Vol 6, Fig 18.10 parts 1 to 4). 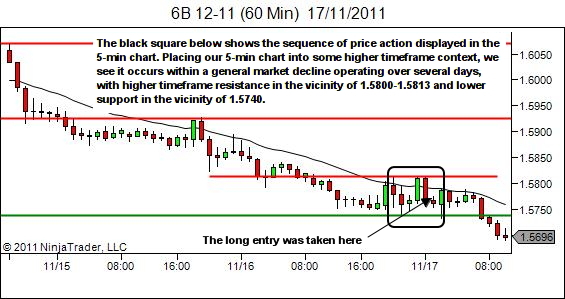 Or if you prefer to use a single timeframe then trade a breakout of the stall region. Here I’d be looking for a breakout of any significant short-term 2-bar swing high or swing low, as demonstrated in the following diagram. 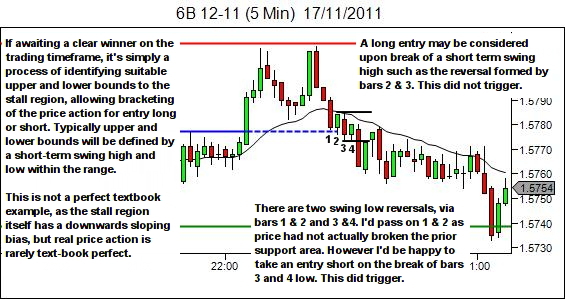 For YTC PAT traders, the break of bars 2 & 3 is essentially a trading timeframe LWP entry for a PB long. 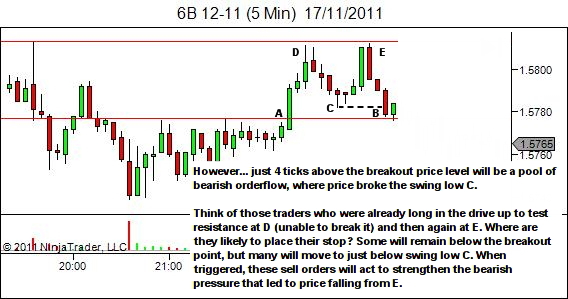 And a break below bars 3 &4 is a BPB entry short, considering the single bar 4 as the full extent of the pullback. There will not always be a clear bias within the price action for future direction. One such time has been demonstrated here, where we have two potential sources of opposite direction orderflow leading to a small pause in movement. At such times, rather than risk over-analysing and trying to pre-empt the move it can be best to just remain neutral and await a clear winner. The winner of course, will be evident when the other side gives up. One final note: If you prefer to limit your trading to one direction only from a breakout of a stall region, consider only trading in the direction of higher timeframe bias. Higher timeframe trend or bias plays little part in my analysis, but in cases such as this where there was a very obvious multiple-day downtrend on the higher timeframe, you may wish to limit your intra-range trading to shorts only.